Hot dogs, turkey chili, homemade onion rings and sweet potato fries, oh my! Their burgers, all cooked over open flame, are also top notch! The beef is top quality grassfed and locally sourced in Sierra Valley. 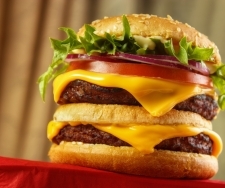 Try their classic cheeseburger and don’t leave without experiencing their Big Dippa. If you're craving a milkshake, you won't be disappointed. They're rich and delicious! PJ’s offers up a buffet-style section along with BBQ ribs, pasta salad, garlic bread, and of course, fresh, made-to-order burgers. The golf course and mountains surrounding the restaurant provide scenery so delicious, it will make you want to order another burger. Come hungry to the Squeeze In as their portions are hearty and often huge. Try the Mushroom and Swiss Burger or a bun-less low-carb style burger. They don’t skimp on toppings, and you’re in luck if you’re a pickle-lover. Just a little bit further up the road in Kings Beach along North Lake Tahoe, Char-Pit is a local gem. We recommend getting their famous Double French Burger and do it up right with all the fixings like extra bacon, blue cheese, BBQ sauce. They do a host of things here, but you can count on everything being smokey, juicy and cooked to perfection. How about a vanilla soft serve cone to take you transport you back to childhood? Who can say no to homemade potato salad? Not us. That’s why we have to go to Marty’s Cafe at least once a week where we order up their Humboldt Fog Burger made up of double patties, bacon, onion straws, jalapeno relish and, yes, home made potato salad. They also do a mean fried egg sandwich.